The school year and daily attendance hours are the same for every class level. The schedule is similar, whiLE children work on different emotional tasks and develop different cognitive skills. Each class engages in a daily enrichment program. These enrichment programs not only help children to develop their various physical abilities, they also enhance vocabulary as each class has its own vocabulary and terminology and some classes incorporate the use of other languages. 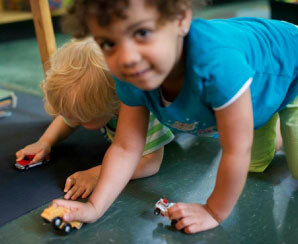 Two year olds are typically learning to develop their fine motor and gross motor skills as well as their vocabulary. They are gaining competence in manipulating objects and becoming independent in toileting and dressing themselves and taking care of their property. In this group language is developing and children are learning to express themselves in various situations, and with the assistance of teachers they are able to achieve their goals with a minimum of conflict. Vocabulary is developing rapidly and some children grow very competent in using language to convey complex thoughts. Teachers work on letter and number recognition as well as playing math games. Children read books every day both at circle time and with individual time with teachers. Enrichment programs are tailored to the needs of this group, and confidence builds throughout the year. Three-year-olds become rapidly more verbal and the level of talk increases as the year goes on. Young threes often struggle to be heard in a group, and often appear unaware that others are talking. By the end of the year they become more aware of the feelings and motives of others. This awareness helps them to negotiate social situations, make friends, and obtain what they need in an acceptable way. Gender differences become important at this age, and there is a lot of dress-up and role-playing. Children will recognize letters, their names, and will begin writing their names and other words. They will count, sort, and enjoy noticing differences in shapes and identifying group characteristics. They begin to be aware of deep concepts such as death, and nightmares often feature monsters, which are symbols of their own emotions and anxieties. We read a great deal and children begin to write their own books, with the help of teachers. Interests begin to blossom into projects, and we begin to take short trips. We often visit museums or have visitors who present various interesting themes. 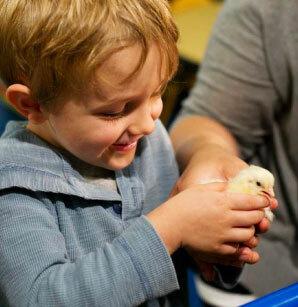 One of our science projects is egg-hatching in the spring. Four-year-olds become more rational, and their language reflects that. They still believe in magic but begin to know the difference between real and not real. They also become aware of the fact that different people have different thoughts. This growing knowledge is often referred to as the Theory of Mind. Their preoccupation is often the group, and acceptance within it. They become skillful players and create complex scenarios and scripts which involve collaboration and flexible role-playing. Four-year-olds are beginning readers, and some can even start reading whole books, while others are still working on letter recognition. Many children begin to write books. Number concepts become more developed and these children can understand and work with graphs and lists – who is in school today and who is not, how many children have blue eyes, for instance. 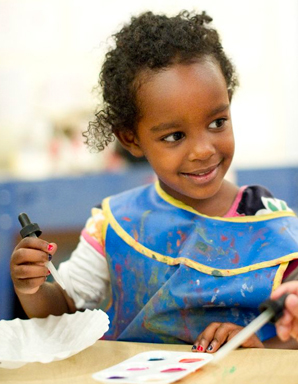 Artwork tends to become representational as children develop mastery of art materials and develop fine motor skills. This class works with various languages, Japanese and Spanish are integrated into the daily routines. The Fours class engages in various projects and they take trips to local areas of interest and short bus trips. Our creative movement class especially designed for early childhood. The class is taught by our dance teacher, the esteemed dancer Yvonne Meier. The program is developmentally appropriate and flexible to allow for the child’s individual expression. Yvonne helps to develop body awareness confidence and recognizing dance as a way to ply and use creativity. 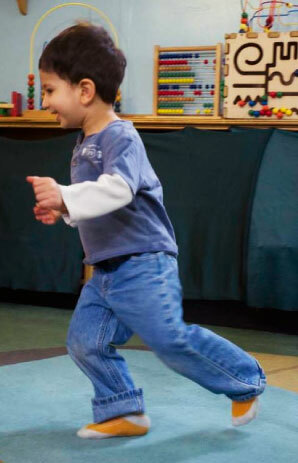 Children work on themes and shapes – curvy, round, straight and directions – over, under, around, and learn to manipulate their bodies in relation to others and to music. In this way they develop gross motor control. Our art teacher’s focus is to build on or scaffold student learning including, looking closely, sorting, re-arranging, noticing, imagining, problem-solving, experimentation and reflection. Various art making skills are addressed and built on through each lesson (e.g. cutting, gluing, mark-making, molding, attaching) Each term we have a Cycle of lessons, Works on Paper, Work in Clay and Building/Construction. Art is an expression of a child’s individuality, not an attempt to create specific projects. And so art classes allow the child to unfold in his or her own approach and vision. These art classes strengthen the child’s fine motor control. We have a weekly instruments program with Chris. During this class, children listen to various instruments such as oboe, clarinet, guitar, and they play vocal and rythm games, imitating the sounds of the instruments and interpreting the music with movement. During the year children will create simple instruments. We have a full kitchen with a large table where children can learn to measure, mix, cut and roll, and to make things they can eat. Our cooking teacher Glennis works with the children using both English and Spanish terms so they learn new words as well as learning to cook. Cooking is an important activity as it helps with math concepts and also allows children to become participants in the kitchen. Our music teacher William works on many aspects of music, and utilizes our library of musical instruments. Children learn about listening to music as well as moving to music and interpreting various kinds of music with their bodies. They learn that their voice can be developed and utilized in various ways. Developing the voice as a tool of communication is very helpful to young children. We have a library of musical instruments, which children use individually and in a group. William helps children to begin to read written music and to recognize various musical instruments. Music terms are introduced into the children’s vocabulary.